​Ever wondered why food tastes different in flight? Or how Delta delivers restaurant-level service in the sky, feeding thousands of customers each day? Meet Christian Hallowell, an accomplished chef and General Manager of On-Board Food & Beverage Design at Delta. 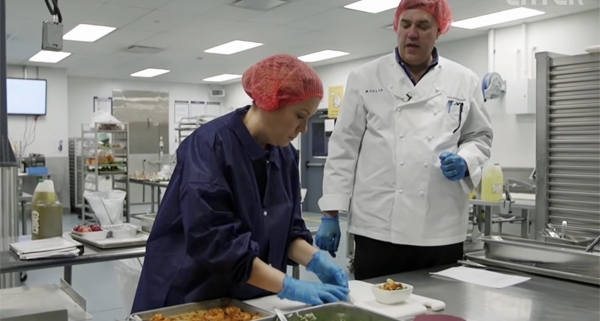 For an episode of “How to Make It” — a video series produced by foodie favorite Eater — Christian took the show’s host, chef Katie Pickens, behind-the-scenes at a Gate Gourmet kitchen in Atlanta to see how food is prepared, packaged, and delivered to customers at 30,000 feet. But creating in-flight meals certainly presents challenges. For one – your taste buds are dulled in flight. To combat this, Christian’s team focuses on creating menus with bolder, more vibrant mixes of herbs and spices to bring out the flavors and compensate for the altitude, and dryness in the cabin.